The following is intended for a popular audience and political realisation in a European context. For a more academic economic approach that focuses on another country (New Zealand), try this. Imagine a world of individual freedom, human rights, and equal opportunity. A world in which these ideals were not only talked about but actually achieved, for everyone -- regardless of cultural background, gender, age, disability and so on. Can you imagine that? What would that world be like? Imagine a world in which everyone, rich and poor, received an unconditional basic income corresponding to the poverty line in their country of residence -- automatically, with no questions asked. People with disabilities would get more than the standard rate, whereas children and non-nationals would get less. But most people in a given country would get the same standard amount. Imagine this basic income being distributed in a way that motivates people to work without forcing them to work. That's freedom! The motivation would be purely financial: the more you work, the more you money you take home. The current system does not motivate people in this way. Unemployment benefits are cut when people find jobs. So it's often not worthwhile to take a poorly-paid part-time job. But a poorly-paid part-time job is often all the capitalist economy has to offer to the unemployed. The result is well-known, because we are surrounded by it: chronic long-term unemployment, psychological depression, inter-class conflict, and the political far right. There is a lot of money in the world. There were 1,810 dollar billionaires on the 2016 Forbes list, 89% of whom were men. They altogether owned $6.5 trillion – as much as the bottom 70% of humanity (more). If this money was distributed equally among the entire world's population, each woman, man and child would get $1000. That's enough to live on for more than a year above a poverty line of $2 per day. This example shows that there is now enough money in the world to eliminate poverty everywhere, by redistributing part of the wealth of the rich. It would not be necessary to redistribute all of their wealth. The rich would stay rich and there would still be a big gap between the rich and the not so rich. How could governments get hold of this money? By changing the law. By introducing or increasing wealth taxes. By harmonizing wealth taxes internationally to prevent capital flight. By simplifying the law both within and between countries to reduce opportunities to evade or avoid tax. By improving international agreements to suppress tax havens. All of these things are possible if politicians have a clear approach that voters can understand. That makes eliminating poverty a realistic, win-win proposition. It is no longer a dangerous revolutionary battle-cry. So why don't we go ahead and do it? Of course, the rich (with some refreshing exceptions) would try to block such a development. But that's not the only problem. There is another big obstacle, it seems. The rest of us find it hard to imagine a world without poverty, because it never happened before. Can you imagine the grim predictions of climate science actually coming true? Most people can't, because they are unprecedented. That is why so little is being done to prevent a future global climate catastrophe. Going back in time, it was hard to imagine the French revolution before it happened, or the vote for women, or the universal declaration of human rights. But today, after these important historical developments, we take them for granted and consider them essential. We have no intention of going back to a world without freedom, equality, and solidarity, or without equal rights for women, or without human rights. Now, imagine a world in which we take it for grantedthat poverty has been eliminated and will never come back. The real possibility of introducing a universal basic income means that a world of that kind is now possible. So there is no longer any particular reason why we should not decide to achieve it. It could merely be a matter of attitude! Imagine that. Many people think that only rich countries can afford a basic income. Not true. Every country has its own tax/welfare system and its own graph of net income against gross income -- a bit like the graph above. "Net income" is disposable or take-home income, after adding welfare or subtracting tax; "gross income" is income before tax/welfare. Even without wealth taxes, basic income can be financed by converting that graph to a straight line -- a "line of best fit" or a "regression line" that balances the budget. The point where the line crosses the vertical axis would be the basic income. This process could happen in any country, because the existing relationship between net and gross income in most countries is already surprisingly close to that straight line. To finance a basic income, most countries could also get additional revenue from wealth, transaction, or environment taxes, especially if there were international agreements to introduce, harmonize, and gradually increase those taxes. Basic income would differ a lot from country to country, but introducing basic income in different countries could help reduce the differences. According to the World Bank, the poverty line in poorer countries is $1.90 per day or $60 per month. But in the USA, the poverty line is about $1000 per month, according to the Census Bureau. In Europe, when the poverty line is defined as 60% of median income, it is about €1000 per month. In a market-based economy, a basic income that corresponds to the poverty line is the only reliable way to eliminate poverty. The reason is this: in a free market, there are always winners and losers, so there is always unemployment. Governments need to ensure that everyone can participate in the market and human rights are respected. Basic income is the only reliable solution to this problem. That's why, in the board game of Monopoly, every player, rich or poor, gets a basic income of $200, paid every time the player passes "go". Without that basic income, you can't play Monopoly. Of course, capitalism is only sustainable if monopolies are prevented by democratic and legal mechanisms, but that is a different issue. Equality of opportunity can only be guaranteed if governments give everyone (regardless of other wealth or income) an amount corresponding to the poverty line, on the condition that in return everyone (regardless of wealth or income) gives back a certain proportion of all wealth and a certain proportion of all income. That's a fair deal for everyone, regardless of differences in wealth in income. Basic income is consistent with human rights. It not only treats everyone equally and with dignity, regardless of wealth or income -- it also controls and reduces the gap between rich and poor. The rising wealth gap is one of the world's most pressing problems, and basic income could be part of the solution; we also need new wealth, transaction and environment taxes. Basic income could help humanity address the challenge of climate change. Climate today's biggest issue, because everything depends on it. Many people regard climate change as a consequence of capitalism. Capitalism created climate change and is preventing solutions; therefore, we need to throw it out. Or so the logic goes. But capitalism could only be ended violently, and the result is unlikely to be democratic. We need a more moderate solution that maintains a reasonable level of democracy (better than what we have now). Capitalism needs to be tamed and brought under democratic control. Basic income is a promising way to achieve that. Flat tax: good or bad? Imagine what would happen if basic income was financed with a flat income tax. Everyone would receive a basic income and everyone would pay the same rate of tax on all additional income. Poverty would be eliminated and the gap between rich and poor would be reduced. Flat income tax has an important advantage: simplicity. Everyone has to pay it, including the rich. It's hard to evade or avoid a flat tax by tricking the taxation office, as the accountants of rich people are wont to do. Unfortunately, flat tax has a bad reputation. Many rich selfish right-wingers don't like paying high rates of tax. They think the solution is for everyone to pay the same rate of tax on all income. Many of those same people also want to reduce or eliminate welfare payments. Both proposals are a recipe for disaster. But those right-wingers are not talking about combining flat tax with basic income, which is an entirely different thing. Imagine what would happen if everyone got the same basic income and paid the same rate of income tax. The same proportion of all the money that anyone earned would go back to the government to finance the basic income and other government expenditure. A glass that is half empty is also half full. No matter how little or how much people earned, everyone would keep the same proportion of their earnings. That is not the case today. Today, if you are on welfare and get a part-time job, you may end up with the roughly same amount of money, as if all the work was for nothing! You may therefore decide not to take the job! This frustrating situation is called a "welfare trap". When people complain that welfare recipients are lazy, they are misunderstanding their situation. Welfare recipients may be unlucky, but they are not lazy. It's the system that is making them look lazy by motivating them to stay on welfare and not to work. If the system motivated people to work, unemployment offices would become redundant. BIFT is a combination of Basic Income BI and Flat Tax FT. It is a tax/welfare system in which everyone, rich and poor, gets the same BI and pays the same FT. Under BIFT, welfare traps and poverty would disappear. For the first time, everyone would have a reasonable chance to participate and compete in a democratically regulated open marketplace. Everyone has the right to enough money to live on (BI) -- a "slice of the cake". Everyone who earns money has an obligation to pay a certain amount to the government (to finance BI, infrastructures, government) and the right to keep the rest. The first point is about freedom from poverty. The second is about the right to own property. These are universal human rights, and you can hardly argue with them. Although the first point has a socialist flavor and the second seems capitalist, both the centre left and the centre right agree about both. From this viewpoint, BIFT is politically realistic. BIFT is based on two numbers. Possible values for a European country are basic income BI = €1000/month and flat tax FT = 50%. Both parameters are arbitrary and would be adjusted in a democratic political process. It might be possible to eliminate poverty if both were lower (e.g. €800 and 40%), because this approach would benefit unemployed people who supplement their income with casual work. But let's go with €1000/month and 50% for the purpose of argument. There would be a "break-even point" where your income before BIFT is the same as your income after BIFT. Using these parameters, the break-even point would be €2000/month. If that was your income, you would pay €1000 in income tax and get the same amount back as basic income. If your income before BIFT was less than €2000, your income after BIFT would be more than your income before BIFT. You would effectively be a welfare recipient. If your income before BIFT was more than €2000, your income after BIFT would be less than your income after BIFT. You would effectively be a taxpayer. Tax would be effectively progressive: the effective tax rate would increase with income. Under €2000/month, people would effectively pay no tax. As income increased beyond €2000, the effective tax rate would gradually increase. At very high incomes, BI would be small relative to income, and the effective tax rate would approach 50%. The transition between "welfare recipient" and "taxpayer" would be completely smooth with no hiccups. Regardless of your income, if you earned more, you would take home more. There would be no demotivating, demoralizing "welfare traps". Benefits would not be means tested and would therefore never be cut. In fact, everyone would be treated equally. The system would not distinguish between the employed and the unemployed. The stigmatisation of unemployment would disappear. Can flat tax be progressive? Flat income tax is a simple system with no thresholds and no income tax brackets. No matter how much you earn, you pay the same proportion of your income in tax. Progressive income tax is more complex. If your income is low you pay no income tax. When you income passes a certain threshold you start paying income tax at a certain low rate. When your income is even higher and passes a second threshold you start paying a higher rate for the income beyond the last threshold. The intervals between the thresholds are called income tax brackets. "Progressive" means that when you earn more money, you not only pay more tax -- you pay a greater proportion of your income in tax. My proposal is to simplify and improve tax progressivity by combining flat tax with basic income. This combination is inherently progressive. Allow me to introduce myself. I am a leftie. I want to eliminate poverty, improve the lives of people on low incomes (the "working poor"), improve gender equality, and reduce the wealth gap. I also studied physics and do research in psychology. I am interested in clear thinking and the correct use of mathematical arguments. Many proponents of unconditional basic income imagine combining it with progressive taxation, with different rates in different brackets. The trouble with that idea is its complexity. A complex system discriminates against low-income earners because you need a tax consultant to understand it. A complex system invites tax consulants to find ways to avoid tax. To eliminate this form of discrimination, we need a simple, transparent system. Without basic income, flat tax increases the gap between rich and poor, because it is easier to make money (income) if you already have some (capital). In this way, flat income tax is effectively regressive. If we want to reduce the wealth gap, it is important to avoid this kind of flat tax. Basic income (BI) is progressive: relative to total income, it represents a larger proportion for the poor than for the rich. Therefore, it reduces the wealth gap: the poor get richer while the rich are relatively unaffected. Flat income tax (FT), when considered alone, is neither progressive nor regressive. But in an economic context, in which it is easier make money if you have more capital, FT is regressive (the opposite of progressive): the result is inevitably a widening wealth gap. A combination of unconditional basic income (BI) and flat income tax (FT), here called "BIFT", is progressive: the more you earn, the more income tax you pay relative to your income, effectively. That is not a political claim, nor is it a trick. It is a mathematical truth. Moreover, BIFT is not sometimes progressive and sometimes not. BIFT is always inherently and continuously progressive, provided BI corresponds roughly to the poverty line (or poverty threshold), below which people are regarded as "poor". BIFT is strongly progressive even for the lowest plausible estimates of the poverty line in any country, rich or poor. Value-added tax (VAT) is tax on everyday purchases such as clothes and food. It is inherently regressive: the more you earn, the less you pay in VAT relative to your income. That's because people with less money spend a larger proportion of their income on items that are subject to VAT: food, clothes and so on. People with more money spend a smaller proportion of their income on those things. VAT hits the poor harder than it hits the rich. But that is not all. In most countries, the regressivity of VAT approximately cancels out the progressivity of income tax, so in the end people are effectively paying a flat income tax. Regardless of your income, roughly 40% of it ends up going to the government by different routes. The details vary from one country to the next, but the general trend is the same. Just to drive that point home: Flat income tax is not a far-right dream. It is already here, in many countries. It has been created by combining progressive income tax with regressive VAT. No wonder the wealth gap is increasing! That must be one of the greatest scams of all time. The solution is to end VAT on everyday consumption (especially regular groceries: vegetables, bread, milk and so on) and get the rich to pay reasonable amounts of tax. VAT is only ok for goods and services that are luxuries or environmentally damaging (e.g. expensive cars). The failure of rich individuals and corporations to pay up is a chapter of its own, of course. They are busy both avoiding tax (legally) and evading tax (illegally). This makes the system as a whole regressive. No wonder the rich keep getting richer. Given this background, we can take a new look at the idea of income tax progressivity. A tax system is only progressive for a given individual if the sum of all welfare for that individual minus the sum of all tax for that individual is progressive. As one supermarket chain once advertised: it's the total of the tape that counts. People have been talking about basic income for a long time, but it still isn't happening. The reason: fake news. The rich and their sidekicks are spreading rumours. We need a reality check! 1. Can we afford BI? Misleading question. It is the current system that is too expensive, first because it is too complicated (necessitating a giant bureacracy to administer both welfare and tax), and second because it makes it too easy for the rich to avoid or evade tax (after which the government cannot afford social services). In fact, any country, rich or poor, can afford BI. It's just a matter of drawing a line of best fit through the current relationship between gross and net (disposable) income on the above graph. The two parameters, BI and FT, need to be adjusted in a political process, making sure government expenditures are covered by government income. The question is rather: How do we want to set those two values? People on the right wing will prefer relatively low BI and low FT; on the left, high BI and high FT. In both cases, the budget can be balanced. Of course other taxes will be necessary (environmental, transaction, wealth), but they can be considered separately. 2. Won't BI make people lazy? Another misleading question. It is the current system that is making people lazy! Currently, if you have no income, you get welfare. If you then get a part-time job, your welfare is cut. So it's not worth working! This called the welfare trap. BIFT removes the welfare trap forever by giving BI to everyone and taxing all income at the same rate. So no matter how much income you have -- if you work more, you take home more. 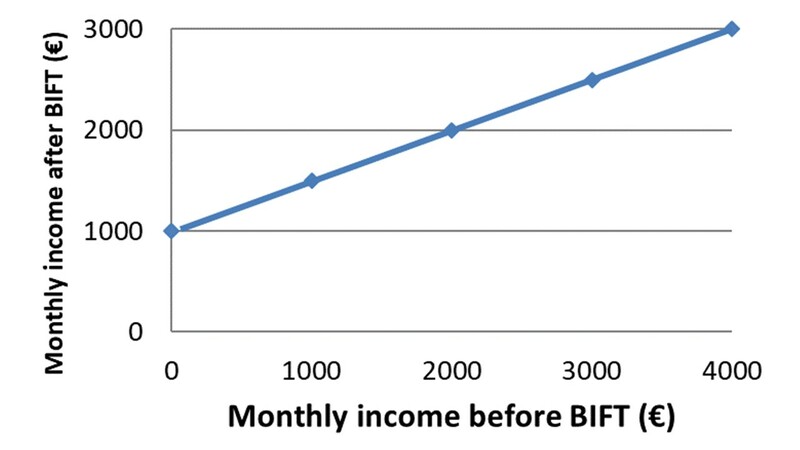 In other words, if your income before BIFT increases, your income after BIFT increases, as shown by the ascending line on the graph. People have been conducting experiments to find out if basic income makes people lazy (e.g. in Finland). The people behind those experiments should learn something about formulating experimental hypotheses and creating experimental designs. Regarding hypotheses, it is the present system that is making people lazy. Really! There's nothing more demotivating than welfare traps. The hypothesis is therefore that BI (corresponding to the poverty line) will make people less lazy. That's what we want to find out! But laziness is not necessarily the main point. Of course there is work to be done and of course BIFT motivates people to work. But what we really want from a modern economic reform is globally sustainable social well-being. There is one thing that all BI-experiments show: people are happier if their existential fears are removed and their freedom restored. Regarding experimental design, you can't perform a controlled experiment that compares the current system with basic income if the participants are simultaneously living in both systems. The confounds are large and impossible to avoid. The only way to test BI is to introduce it. It's obvious that the world needs BIFT. Once you understand how it works (and nothing could be simpler), it is difficult to imagine what other system could possibly be better. That may sound arrogant, but I have been struggling with this question for many years. At some point, one has to draw conclusions and consider the implications. None are currently known. Please write to the author if you know of any disadvantage. BIFT would solve a long list of political and economic problems. The end of poverty: basic income would correspond roughly to the poverty line. A smaller wealth gap: less difference between rich and poor. A smaller gender wealth gap: less difference between disposable male and female incomes (part-time work would become worthwhile; parents would receive their children's BI). Universal work incentive: no welfare traps (you don't lose your benefit as your income increases). More personal freedom: work as much or as little as you want; no stigmatisation of unemployment; freedom from poverty. Less meaningless bureaucracy and invasion of privacy by tax and welfare offices; less financial waste. Less corruption: fewer legal loopholes for accountants of the rich to explore. A weaker far right: fewer deeply dissatisfied citizens for populist politicians to prey on. More democracy: a simple, transparent system that is easier for voters to understand; more power for democratically elected governments and less for corporations (e.g. to address climate change). For more details on these points, including the question of how best to transition from the current system to BIFT, click here.